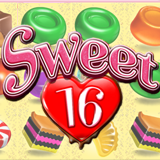 The new Sweet 16 slot from Realtime Gaming is a cavalcade of candy with a sweet new feature called "Morphing Symbols". Golden Euro Casino will give you 16 free spins to try the new game online or on your smartphone or tablet in its mobile casino. To get your deposit (up to €100) doubled and get your 16 free spins, use coupon code SWEET16 when you make a deposit. This bonus is available until 31 December 2016 only. New candy-themed slot from Realtime Gaming has new Morphing Symbols feature. Sweet 16 features Realtime Gaming’s new Morphing Symbols feature. Any symbols in any winning combination explode into a new symbol and create another winning combination. With each win, the prize is multiplied by more – up to 10X the win. Symbols keep morphing until there’s no win. Three or more Lollypop scatters start 16 Free Games. During free spins the morph multiplier increases even more -- up to 20X. There is no tournament entry fee. Players start with 6000 credits and have 6 minutes to score as high as possible. Add-ons are available (€3 for 14,000 credits, 4 minutes).